The bedroom should be your sanctuary, an oasis where you can rest and rejuvenate from the day’s stress. 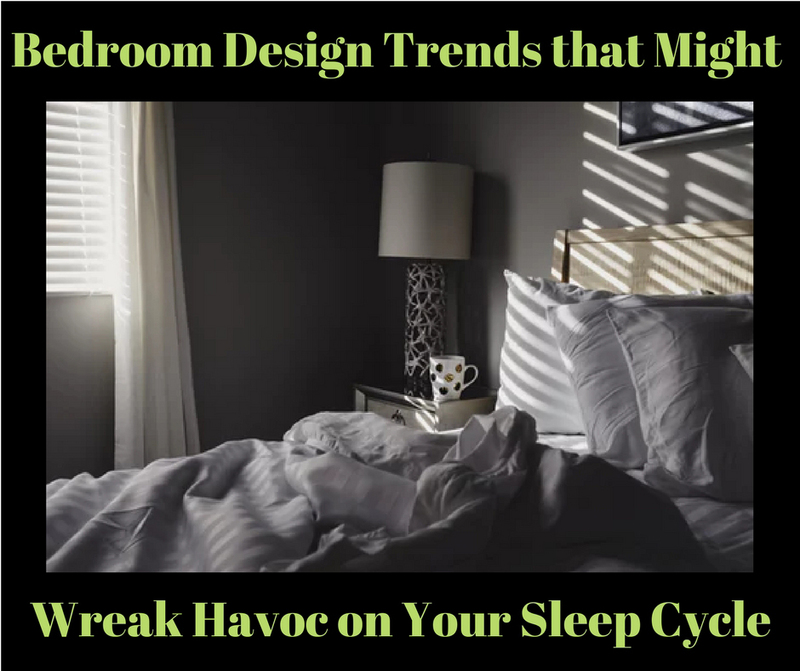 But, the very design trends you love could be wreaking havoc on your sleep cycle, leaving you exhausted during the day. If you want to enjoy a better night’s rest, here are a few trends you might want to let pass you by. Light, airy curtains are beautiful, but they need some backup if you’re going to use them in the bedroom. Circadian rhythms determine when you get tired and wake up, and they are heavily influenced by light. Even small amounts from a streetlamp or a passing car can interrupt your sleep cycle. Blinds or shades coupled with heavy curtains block out the most light, but they may not be for everyone. If you love letting natural light into your room during the day, get the translucent curtains you love but also have shades or blinds on your windows to block out as much light as possible at night. The artificial light you use in your bedroom can have just as big an impact as natural light. Low-wattage bulbs used in lamps that give good directional lighting put light where you need it but keep it from overwhelming the room. Bulbs that give off a warm yellow or orange glow are better than any blue spectrum light, which can trick the brain into thinking it’s daytime. Televisions, laptops, smartphones, even e-readers give off enough light to cause changes in your circadian rhythms. Stop using electronics at least an hour before bedtime, and keep them out of the bedroom if at possible. If not, consider a cabinet with doors that can be closed so the TV can’t be seen when it’s time to sleep. Try to create a space devoted solely to sleep. That way your body naturally starts to wind down on its own. Colors have a powerful impact on mood. Vibrant colors like red, orange, and bright yellow in bold hues energize and stimulate the senses. A bedroom needs to be a place of refuge, of peace and calm. Cool neutrals like white, gray, and beige encourage relaxation. Cool, soft hues of blue, green, or violet can reduce your heart rate and blood pressure contributing to an atmosphere of quiet calm needed to induce restful sleep. Gorgeous metal finishes are surging onto the decorating scene. While you don’t have to avoid metal finishes all together, you need balance. Natural elements like wood, indoor plants, and other natural materials create a serene oasis within your home. A metal nightstand with a potted plant like lavender or chamomile, both of which have sleep-inducing properties, can provide the balance your mind and body need. Blending nature with man-made elements can work with almost any style from mid-century modern to cottage and modern farmhouse to contemporary. Certain minimalist trends put the mattress almost on the floor with only a wooden platform for support. While many of today’s mattresses are designed to be used with a solid foundation, you may need the support offered by a box spring, especially if you have back or joint problems. You also need to think about how comfortable it is for you to get out of the bed in the morning. A mattress that’s too low to the ground can make it difficult. Proper support puts the mattress at a more reasonable height.